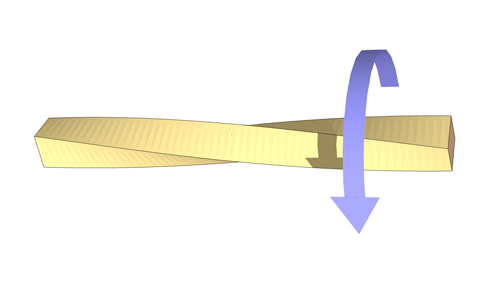 In above equation τ is the torsional stresses produce in the shaft, r is the radius of the shaft, T is the torque applied at the end of the shaft and J is the second polar moment of inertia of the shaft. Second polar moment of inertia of the shaft can be finding out by following formula where D is diameter of the shaft. This first equation can be rewritten in the form of angular displacement, modulus of rigidity and length of shaft and follow. Take calibrating arm and put in on square end of torque shaft and by adjusting hand wheel level the shaft. Put five kg on calibrating arm and make the dial gauge reading to 0 using hand wheel. Measure the specimen initial length, initial diameter and initial gauge length and put these values on the provided table shown below. Mark a line along the length of specimen with the help of permanent pen. This will help us to measure the rotation during twisting. 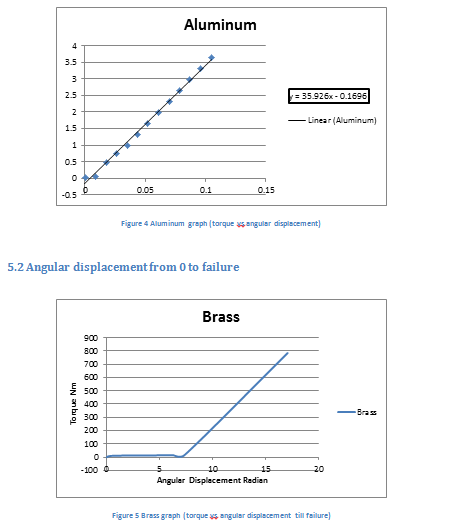 While testing, following sequence (as show in table) of applying the angular displacement should be considered. Experiment was performed according to the steps mentions above and all the data obtain as a result of experiment is arranged in the table below. 5. It is impossible to predict the point where failure will occur as a result of torsion loading. Failure mostly occurs at the point which has any internal defect or cracks; if not the point with highest stress concentration will be the point of failure. 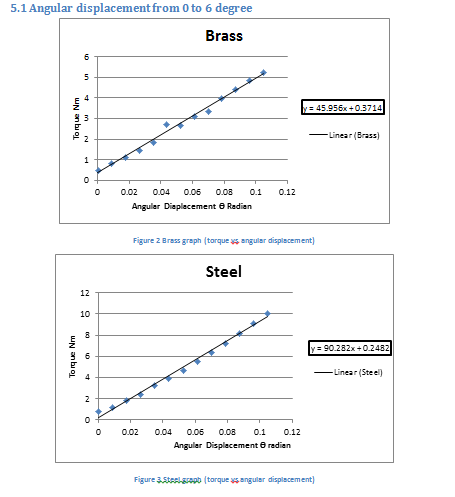 Torsion test have been perform on three different materials (brass, steel and aluminum) and with the help of experimental data, value of modulus of rigidity and shear stresses is calculated. Aluminum came second among the three materials as it can bear more shear stress and applied torque than brass but cannot take as much torque as steel can. It can take more angular displacement other two materials and it is due to material property called ductility. Brass has third position among the available materials. 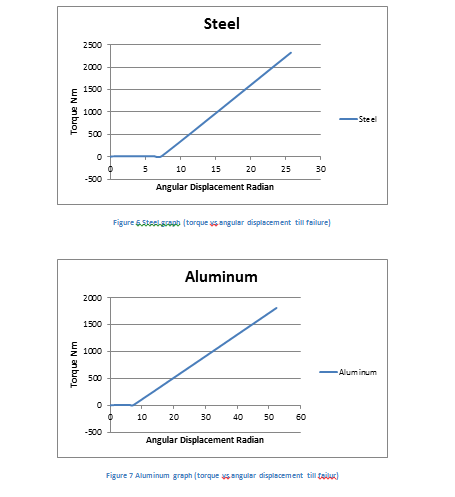 Although it modulus of rigidity is greater than aluminum but it fails at lower torque than aluminum. It has the least value of angular displacement at the fracture, this show that it has lowest ductility among the three. The reason that two values of shear stress obtain are different is that equation one consider the geometric properties like polar moment of inertia and equation two use material properties like modulus of rigidity. On the bases of these calculations we can now differentiate between the properties of different materials and can predict their behavior under torsional stress.